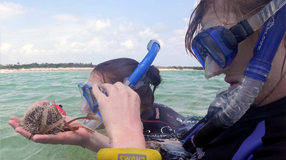 Fieldwork in the Bahamas energizes biology, geology students. The Nile is not just a restaurant in Hyde Park. Now it displays Middle Eastern photographic prints from the Oriental Institute archives. Benjamin Recchie, AB'03, gets his one and only shot at the mother of all quiz shows. Rob Sama, AB'93, resurrects a piece of Chicago beer history. From crime to commuting, the Data Science for Social Good program brings high-tech tools to bear on intractable problems. Which economist do you agree with most? A Chicago Booth panel develops a quiz that will tell you whose ideas most align with yours. Chicago Booth's James Schrager, PhD'93, says brutal honesty, strategic thinking, and high energy are the three most important traits for entrepreneurs. UChicago's Robert Pape, PhD'88, and David Schneyer, AB'11, argue that the United States shouldn't be afraid of Al Qaeda in Yemen. Giri Swamy, AB'95, found inspiration for his online miniseries Headshop in his emergency-room work. A "desperate need to find new technologies" drives Argonne's Joint Center for Energy Storage Research. Students graduate. Dorms close. But house traditions have a life of their own.